4 Column Cast Iron Radiator - 17 Sections - Traditional Polish and Lacquered. 760mm tall, 1050mm wide. Our classic 4 column 760mm high cast iron radiators, taken from the hugely popular Neo-Classic design that was introduced during the late Victorian era and has remained popular. This traditional design is both a design classic and has a very high heat output. 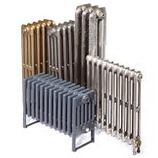 Traditional polished cast iron radiators are polished on the front, top and sides. Our Lacquering process means that your cast iron radiators will not require any ongoing maintenance.